Welcome to our article on the best food for French Bulldogs! Your French Bulldog is a precious member of your family. But did you know your fur baby also comes from a long and interesting canine history? Today’s French Bulldog (also known as the Boule-Dog Francais) can trace its ancestry all the way back to the 1860s. Your dog comes from a strong working dog lineage. This has resulted in pet French Bulldogs with fierce loyalty and protectiveness towards their loved ones. However, there are other factors of which you may already be aware. Due to the shape and size of her face, your French Bulldog also has some special health needs. One of these special health needs is choosing the best French Bulldog food for her nutrition and chewing style. Should you choose a special French Bulldog puppy food, and if yes, what are your options? Are there any French Bulldog food allergies or sensitivities you need to be aware of? These are important questions to make sure your sweet French Bulldog has all the nutrition she needs to grow up and enjoy the healthiest, happiest life with you! NOTE: If you are still pondering whether to add a French Bulldog to your family, you might really enjoy reading through our complete guide to the French Bulldog breed! Did you know there are three basic canine muzzle shapes? Hounds like Dachshunds have dolichocephalic muzzles that are longer than they are tall. German Shepherds, Spaniels and Poodles have mesocephalic muzzles that are balanced in length and width. And your French Bulldog has a brachycephalic muzzle. This word comes from the root words “brachy” (short) and “cephalic” (head). So a brachycephalic muzzle is just a fancy way of saying your dog has a “short head” muzzle. More importantly, the particular shape of your dog’s muzzle will impact how he eats. Your French Bulldog’s brachcephalic features influence how he picks up his food and also how he chews his food. Your French Bulldog’s jaw is smaller on top than it is on the bottom. His face is also more flat than breeds with longer or taller muzzles. So how he picks up his kibble and chews it is going to look quite different than how a dog with a longer nose or a bigger upper jaw would chew their food. For this reason, one key thing to look for in French Bulldog dry food that can make all the difference in how easily your dog eats and enjoys his food is smaller, curved kibble. Introducing a slow-feeder bowl or puzzle bowl will help with this breed’s tendency to gulp down their dinner (the same holds true for drinking water). Kibble that helps to keep your dog’s teeth clean will reduce this breed’s incidence of dental issues, some of which are caused by having big adult teeth inside a small adult mouth. French Bulldog owners pretty much agree on one thing: their dogs love to eat! But obesity can place extra pressure on the French Bulldog’s narrow airways and cause breathing problems. Just like with people, offering your dog well-balanced meals can cut down on between-meal food cravings and begging, especially since French Bulldogs have been known to be more enthusiastic about eating than they are about exercising! 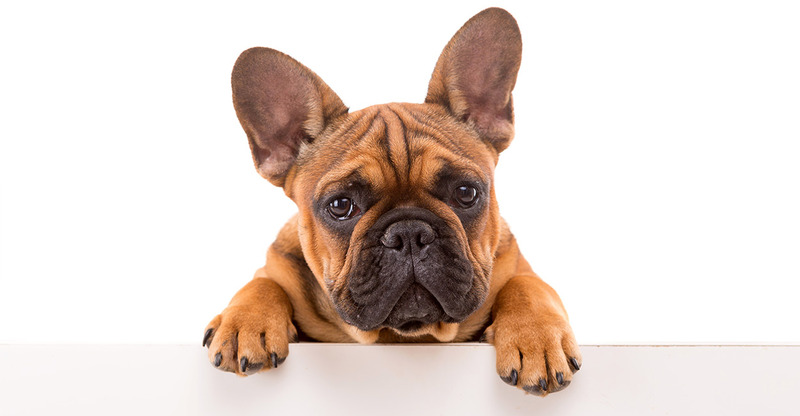 To learn more about caring for a brachycephalic dog breed like the French Bulldog, we invite you to read through this informative article. Puppies of any breed, whether large or small and regardless of muzzle type, need special nutrition to grow up healthy and strong. A growing puppy may even eat more than an adult dog of the same breed because their young bodies and brains are growing so fast! Your French Bulldog puppy is no exception. If you are caring for a French Bulldog puppy right now or soon will be, you need to know exactly what type of French Bulldog puppy food to feed her. Today’s options for the best dog food for French Bulldog puppies includes both breed-specific and dog size-specific foods. Your French Bulldog is considered to be a small breed dog. Most adult French Bulldogs weigh 24 to 28 pounds at maturity, although there are some exceptions. Many veterinarians agree that puppyhood is an important time to feed your French Bulldog food specifically designed for the nutritional needs of small breed puppies. Small breeds and large breeds have different nutrition needs in terms of managing how fast they grow. So you want a puppy food that is designed for a small breed puppy’s growth. Your vet can help you determine the portion size and meal frequency. They’ll also help you to choose the right French Bulldog puppy food if you are unsure. Finding the best food for French Bulldog puppies gets much easier when you know what to look for. Hone in on simple French Bulldog food recipes enriched with the nutrients, vitamins and minerals your small breed puppy needs the most. a full spectrum of vitamins and minerals. These highly rated and popular French Bulldog and small breed puppy foods can help your puppy stay healthy in those critical first 12 months of life! Royal Canin is a dog food maker that does a particularly great job of creating breed-specific recipes for puppies and adult dogs from different size breeds. This French Bulldog puppy food kibble is designed to be easy for your small puppy to pick up and chew and the recipe supports a growing puppy’s digestive, skin and immune system health. There is also a Royal Canin French Bulldog Junior dry dog food. This grain free, protein-rich, low carb puppy food is a perfect fit for your French Bulldog’s unique nutritional needs. This food is enriched with Omega-3 and Omega-6 fatty acids, DHA and probiotics to support healthy skin and coat development and healthy digestion and elimination. Calcium and phosphorus ensure healthy bones, teeth and claws. You can choose from salmon or turkey flavors or mix and match for some variety. This easy-to-digest and nourishing turkey, salmon and oatmeal recipe features smaller kibble bits for small puppy mouths. This food is enriched with probiotics for healthy digestion, DHA for healthy brains and eyes and essential fatty acids for healthy coat and skin. Digestion issues like sensitive stomach, food allergies and flatulence (gas) can often be more prevalent in brachycephalic muzzle types. Dogs with a brachycephalic muzzle can struggle to breathe and eat at the same time because of their smaller nostrils. Instead they just open their mouths and literally “inhale” their dinner – and take in lots of extra air along with it! Not surprisingly, this air then goes down, down, down into the stomach and intestines right along with your dog’s food, where it burbles around until it finally comes out the other end in a big gassy fart – yuck! Other common reasons your French Bulldog may suffer from excess gas are sometimes tied in with French Bulldog food allergies and sensitive stomach issues. For instance, if your French Bulldog has a gluten intolerance or a sensitivity to carbs, dairy, fermented foods, or certain specific ingredients, these can create digestive difficulties that result in gas. If you notice your French Bulldog is getting gassier or seems to be struggling to digest her food well, it is important to talk with your vet before just assuming it is the food that is to blame. Your dog’s discomfort may very well stem from a food allergy or a sensitive stomach, but it could also be a symptom of a bigger underlying health condition such as ulcerative colitis, which French Bulldogs can be prone to developing. Scheduling a vet exam first before making any other changes is the best way to know for sure what is causing your Bulldog’s discomfort. If your dog’s vet feels that food allergies or a sensitive stomach could be causing your dog’s gassiness, then it is time to choose a new food for your dog to try. Here, often the best dog food for French Bulldogs with gas and the best food for French Bulldogs with sensitive stomach can be one and the same, which can help to simplify your search! Look for foods with probiotics (such as those found in yogurt), added gentle fiber, digestive enzymes and limited ingredient lists, which can all help with easing your French Bulldog’s digestive discomfort – as well as your own when he lets another one fly in your direction! 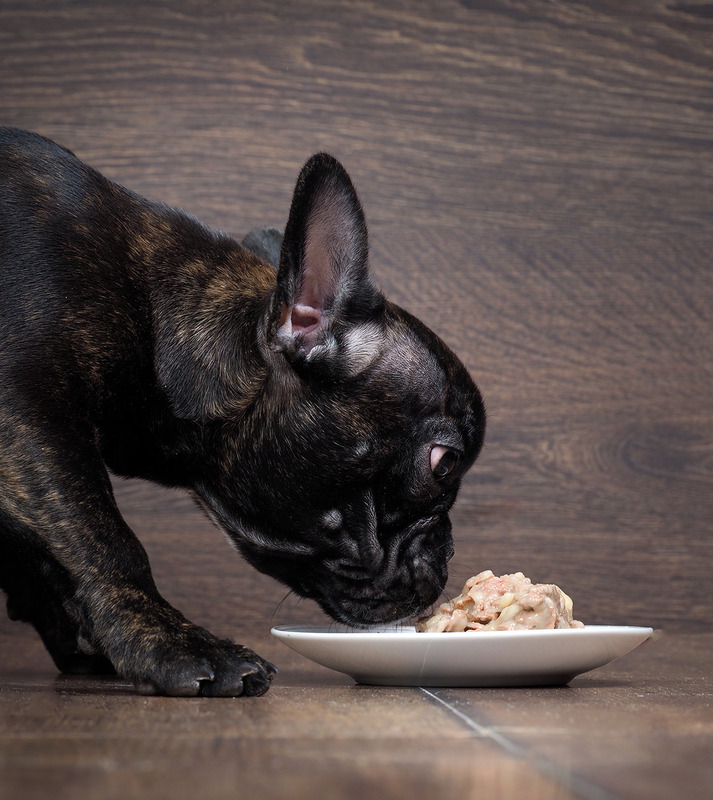 These limited ingredient small breed dog foods may help ease your French Bulldog’s digestive issues – and here again, ask your vet for guidance if you need help choosing a food to try. Hill’s Science Diet has a chicken and barley dry food and a salmon and vegetable wet food that are both formulated for small breed dogs with sensitive stomach and skin issues. These can be fed together or separately. The dry food contains beet pulp for extra fiber, plus antioxidants, Vitamins C and E and essential fatty acids to enhance immune system function. This limited ingredient dry dog food for small dog breeds consists of chicken and easily digestible, high fiber sweet potato. It also features smaller kibble that is easier to chew and pre-digest in the mouth. The kibble also helps to clean your dog’s teeth and gums. Veterinarians tend to agree that narrowing down French Bulldog allergies best food choices often begins with limiting the ingredients in your dog’s food. This limited ingredient dry dog food is gluten free and features a single protein and a single fiber source. Choose from salmon and potato, lamb and oatmeal, duck and oatmeal, turkey and potato or salmon and peas. You will never lack for choices when shopping for a dry dog food! But finding the best dry food for French Bulldog adults can get overwhelming with so many brands competing for your wallet! Here, focusing in on small breed or breed-specific dry dog food can start to narrow down your options to the recipes that make the most sense. Choosing a high protein, low carb, enriched adult dry dog food will form a solid foundation for your French Bulldog’s overall health. Royal Canin is one dog food maker that is especially good about creating breed-specific recipes to cater to the nutritional needs of different dog breeds and dog sizes. The kibble in this dog food is designed with the French Bulldog’s unique jaw shape and size in mind. The protein content (24 percent) and essential fatty acids content caters to this muscular breed’s need for protein and essential fatty acids. This adult dog food is packed with protein. Choose from three flavors: salmon, turkey or lamb. It is grain-free and low-carb to keep your French Bulldog slim and trim. Probiotics and Omega-3 and Omega-6 fatty acids help keep your dog’s digestion running smoothly and help to maintain a healthy skin and coat. This wildly popular small breed dog food includes real venison, boar or lamb in a high protein, low carb recipe. This food features a small kibble size along with added probiotics, antioxidants and essential fatty acids for healthy skin, coat and digestion. Wet food in general will be easier for your French Bulldog to eat. Adding a bit of wet food in with your dog’s dry kibble can also make the kibble easier to pick up and chew. If you have had any trouble getting your French Bulldog to drink enough water, adding the extra hydration from wet dog food can also help to keep your dog hydrated. Plus, wet dog food tends to be quite tasty! Your French Bulldog will likely gobble up these natural, grain-free, gluten-free, high protein options, which represent some of the best wet food for French Bulldogs options. This grain-free small breed wet food is also gluten-free. It is enriched with essential fatty acids, vitamins and minerals for a nutritious addition to your French Bulldog’s diet. Choose from salmon, chicken, lamb, beef, duck, rabbit or venison flavors. This small breed dog and puppy food comes in salmon, chicken, beef, lamb, venison and quail flavors with tasty vegetables in gravy. It is grain free and gluten-free and packaged in carefully controlled portion sizes to be a healthy, tasty addition to your French Bulldog’s diet. What Is The Best Food For French Bulldogs? All the options you just read about represent some of the best food to feed French Bulldog puppies and adult dogs. The best food for your French Bulldog is one which meets their own unique needs. If you’re struggling to find the perfect diet, your vet can offer lots of advice and support. The sheer number of options can make it really hard to choose one single food. So it can be wise to start out purchasing food in the smallest possible quantities until your dog has shown a clear preference. Plus, variety of flavors and brands can help later if you ever need to switch dog food brands or flavors! What Food Does Your French Bulldog Like? Tell us what your French Bulldog is eating and find out what other owners are feeding theirs in the comments! Ackerman, N., BSc(Hons), RVN, CertSan, CertEcc, A1V1, C-SQP, “Nutritional needs: are life-stage and breed diets fact or fiction?,” The Veterinary Times UK, 2013. Chandler, M., DVM, “How to Ensure Your Dog Gets the Right Nutrition,” The Telegraph UK, 2017. FBDCA, “French Bulldog Health and Conformation,” The French Bulldog Club of America, 2018. AKC, “French Bulldog History & Training/Temperament,” American Kennel Club, 2018. Yuill, C., DVM, MSc, CVH, “Brachycephalic Airway Syndrome in Dogs,” VCA Hospitals, 2018. Kane, E., PhD, “Flatulence in dogs: Annoyance or sign of GI illness?,” Veterinary News DVM360, 2015.